I first mentioned SocialGuide 1 month ago when describing how influential MTV’s Jersey Shore is across the social networking ecosystem. The New York-based social entertainment guide bills itself as “The smarter, social way to discover what’s buzzing on TV”, and as of this recent launch, at the Movies as well. Previously, SocialGuide only scored social influence metrics for TV shows based on buzz from Twitter and Facebook conversations, ranking the top shows according to how popular word of mouth was around various TV series. The socially aggregated ranks are updated in real-time to reflect the current popularity of each show being being watched, listing them alongside an incoming flood of Twitter updates also being updated in real-time. To build on the success of its social TV scoring, SocialGuide has launched SocialGuide Movies, now allowing it users to sort movies based on genre (action/thriller, comedy, drama, etc), or whether it’s In Theaters Now or Coming Soon. While the service is definitely interesting, the question remains: What makes the social ranking of movies and TV shows important to the progression of modern entertainment? SocialGuide’s Founder and CEO, Sean Casey, sat down with me for a chat. Sherilynn Macale (SM): So the big news is that SocialGuide is finally including movies in its social viewing lineup. Is this a huge deal? And how do you think this will benefit SocialGuide’s consumers, if at all? Sean Casey (SC): Yes, we think it’s a big deal. 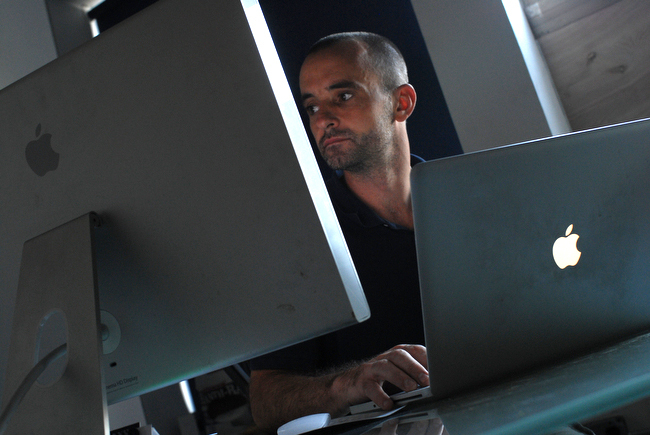 We’re interested in revolutionizing the methods by which consumers discover what to watch. Our SocialGuide for TV takes the traditional Electronic Programming Guide (EPG) and infuses it with social intelligence to help people find something to watch. SocialGuide for Movies brings social to traditional movie listings. 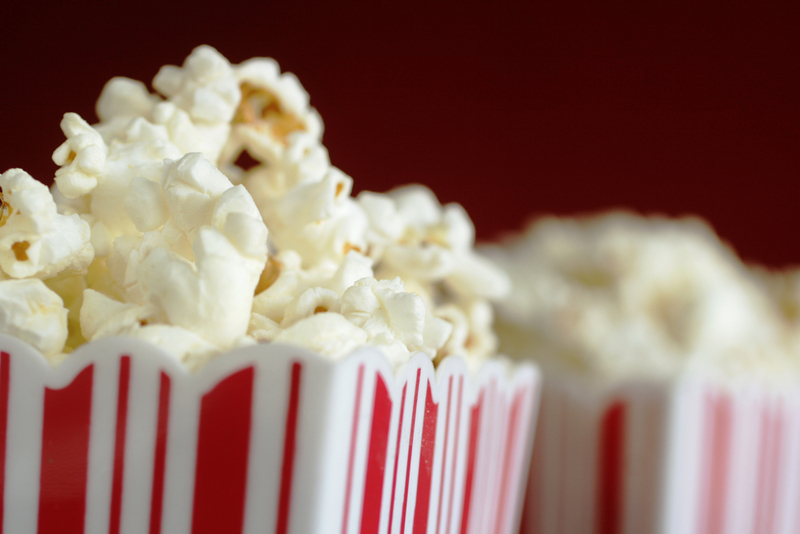 We think the social buzz around a movie can be instrumental in helping a movie-goer make an informed decision on where they should spend their money at the box office. SM: So how does it work, exactly? What sort of metrics is SocialGuide using to evaluate what makes a socially top-ranking tv show or movie? SC: We take a data feed of the movies playing in theatres from our data partner Tribune Media Services (TMS) and ingest it into our Intelligent Social Recognition System (same as we do for TV) and create a series of keywords and keyword phrases that we use to look for people talking about a movie on Twitter and Facebook. We have two listings: One for movies that are “In Theatres” and one for movies that are “Coming Soon”, and we rank the movies based on the buzz the movie has been receiving in the last 24 hours. But we are also looking at some other unique metrics as well. SM: Oh really? Can we get a hint? SC: Well, our “Intending to See” metric is completely unique. It reveals the unique number of people who have expressed an explicit intention to actually go see a movie. We’re very interested in seeing how this metric shrinks or grows as the movie moves from coming soon into theatres. In the coming weeks we’ll be releasing our public ranking for US Theatrically Released Movies (similar to what we do on TV with Social 100). Our “Intending to See” metric will be one of a few different metrics we’ll be featuring. 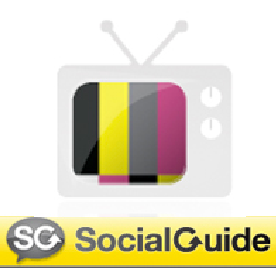 SM: SocialGuide already has a its TV rankings available on iPhone, iPad and Android. 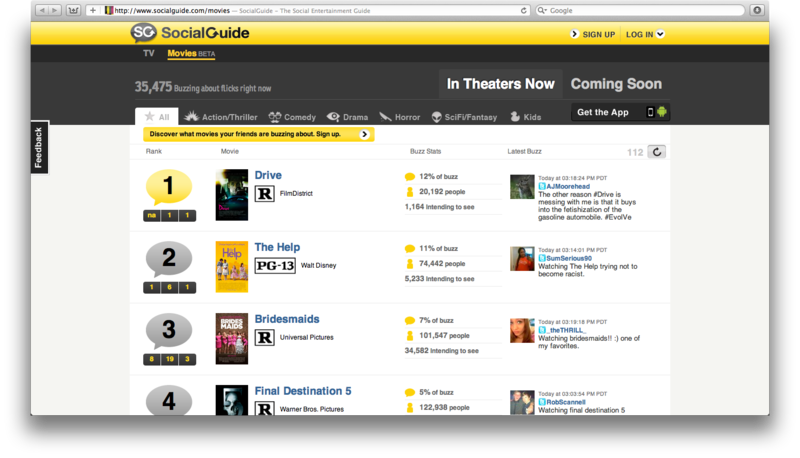 Does SocialGuide have any plans to go mobile with its movie listings as well, or reach any other platforms? SC: We released our SocialGuide app in June and are working on a few major releases over the next four months. SM: Okay, so what big names are currently the top of the list for Movies — do you have any interesting points to add about them? 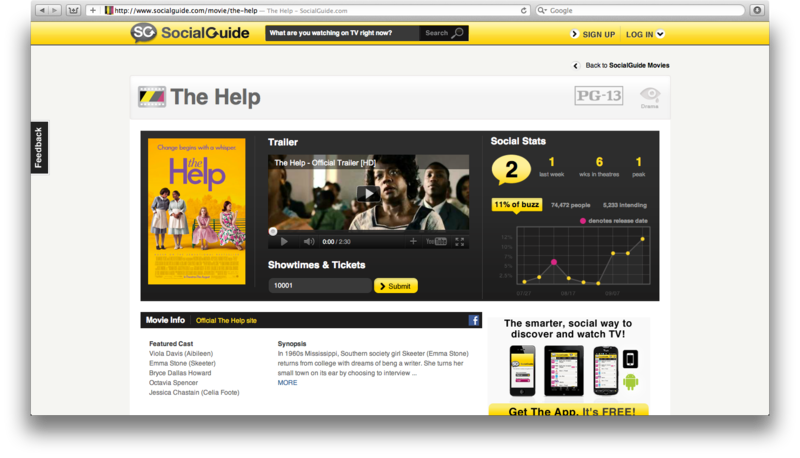 SC: Its been really cool to track the social buzz around the movie “The Help“. This is a good example of a movie that has gotten bigger after its release date (not the norm for most movies). Our social Stats section for The Help tells a pretty interesting story. Most movies’ Social Stats Graphs look more like this. SM: Stats may be interesting for studios but why is looking at movie specific social acticity helpful for consumers? SC: The Buzz section includes a feature that surfaces all comments about a movie made by anyone you follow. We also have a “Most Retweeted” feature that displays the most retweeted comments made about a specific film. These are comments made by high-profile celebs and some really clever/funny moviegoers. Also we provide 2 streams: People and Critics. Our People stream contains only comments from people who have seen the movie giving the consumer access to a real-time movie exit poll. Our Critics stream surfaces the Tweeted reviews from the best critics. At SocialGuide, our mission is to make entertainment buzz relevant, meaningful and useful for consumers and businesses. With SocialGuide Movies we wanted to really focus on this mission and have created some very novel features that organize the social chatter around a movie that make it fun and meaningful for consumers. The social takeover extends beyond networking. The proof is in the pudding. Social media is not just restricted to Facebook, Twitter, or Google+ anymore — it now extends into the way we eat, the way we dress, the way we interact with people, and now even to how we entertain ourselves via television and movies. SocialGuide is capitalizing on that idea by offering a comprehensive list of real-time data that ranks and scores our broadcasted entertainment. In this way, it hopes to be the main influencer for how consumers decide what to watch, as well as provide a valuable guide for the film industry and viewers alike. Now studios can gauge the social impact of their films or TV shows compared to others while being able to monitor the fluctuating growth of their social influence. To check out SocialGuide’s new Movies section, head on over to its website then drop us a comment to let us know what you think.